I moved to Switzerland with my wife around a year ago. Some months later, I hired a Sunrise plan with an iPhone 4S together with a USD 45 subscription for my wife. Later on, I got another one for me. I also encouraged friends and family here to get a plan too, so we could all talk for free (on the same network). As result, my sister in law and my brother in law also got a mobile plan with Sunrise. A month ago, I started working in a project for a company in Kaiseraugst, Switzerland near the border with Germany. Yesterday I received the bill from the past month and Sunrise decided to charge me roaming costs, even without leaving the country. The problem is that Sunrise has a very bad coverage on different parts of Switzerland, one of those is Kaiseraugst, and my iPhone 4S if set to automatic network usage is changing all the time to a network in Germany because the signal strength in this Swiss city is not good. So this month only I received 50 (yes, 50, I counted them) messages by Sunrise saying me that my phone was in “Roaming mode”. 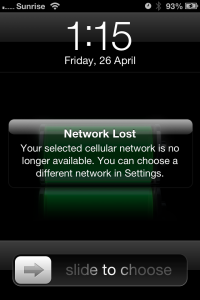 I also tried setting the iPhone 4S to use only the Sunrise network but I also receive several messages saying “Your Selected Cellular network is not longer available. You can choose a different network in Settings”. You can imagine how annoying these messages can be. So I didn’t only had to stand with all these messages but also pay for this! 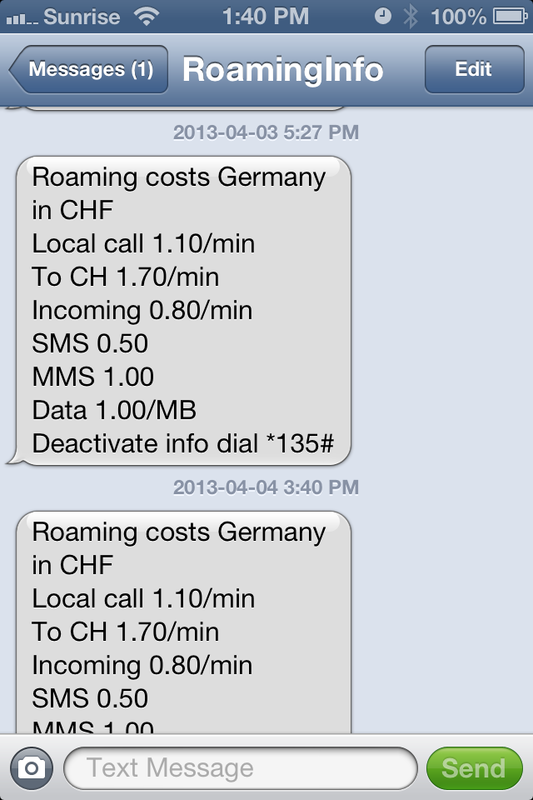 Because my phone is switching automatically between roaming in Germany and Sunrise Network in Switzerland several times during the day, and I received a couple of normal calls, I have to pay for them because maybe, the phone was connected to a German network at that time instead of a the Sunrise Swiss network as it should be. As I said, I AM I SWITZERLAND! This was insane, so I decided to contact Sunrise customer support service. One of the 50 messages I received during the last 30 days while working in Kaiseraugst, Switzerland. 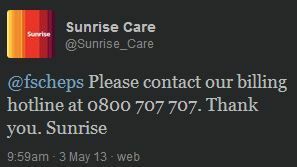 I contacted Sunrise over Tweeter (@Sunrise_care) and they suggested me to contact their call center: (0800 707 707), so I did. A guy called “Peter” answered and after explaining him the situation his answer was: “You can set your phone to use a specific network”, I explained him that Sunrise network was so bad that I was receiving annoying messages saying that the connection is no longer available and that it was not fair that I should paid for Sunrise´s bad service. So he decided to reply something that left me shocked: “I am sorry but Vodaphone Germany wants to get paid for the use of their network and you have to pay them”. I got really pissed off with the company´s position and asked him to send me a written explanation of what he just said. He told me I was going to receive a written response within the next 14 days, (I don’t think I will ever receive a response like this in a document). A few days ago I wrote a post with 10 ways to make your customers recommend you. This guys at Sunrise clearly don’t have an idea of what offering a good service is and that is why everybody is talking about Swisscom as the best mobile service you can get in Switzerland (although more expensive). Some days back I also contacted the guys at Sunrise24.ch, a service also offered by the same company, that includes calls to all the national networks, unlimited SMS and unlimited Internet. It costs USD 49 a month so I asked them if I could upgrade my subscription (I am paying less than this) to this plan and they told me they cant transfer my existing number to this offer. So they don’t even allow a customer to get a better plan even if he is willing to pay more for it. I read on English Forum a post on how to get one of this plans if you are interested on the workaround. At this point I will probably cancel my subscription, my wife´s too and discourage any friend or relative to ever get a product from them again. I will have to say to my friends I was wrong, but I have the experience now and Sunrise is the exact example on how to do things the wrong way. – Dont worry Fernando, we can see that your daily usage of the phone is in Kaiseraugst area so until we solve our signal strength issues, we wont charge you any German Roaming costs in your account produced from Monday to Fridays from 8 AM to 8 PM. – Fernando, at this point we understand that the service we provide is faulty, so if you want to cancel the contract with us we will understand and we wont make you pay any cancelling fees. Logically you can take your number with you to the provider you choose. 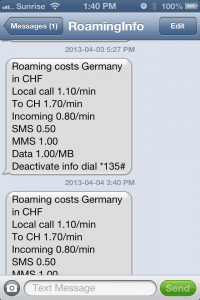 Which mobile provider you find best within Switzerland? UPDATE 7/5/13: Yesterday I received an email from the “Social Network” support team and they commented me that they credited me CHF 50 on my account in a way to “say sorry” but they told me that the problem I am facing will remain. So they solved my initial complain to avoid paying for something that doesn’t make any sense. But didn’t fix the core of the problem. Its so sad the service quality Sunrise is providing. I also heard a lot of comments from friends complaining about how bad they are. I use Swisscom since a couple of years and although no company is perfect this is the best one, but also the most expensive one. I guess you have to pay more for a better service.